If you’re fortunate enough to have a garage or workspace, few things are as satisfying as a functional organizational system for all those tools. And while keeping the goods stored away in a tool chest is a great start, why not display those organizational skills and add a bit of context to your workshop setting by displaying those tools proudly? 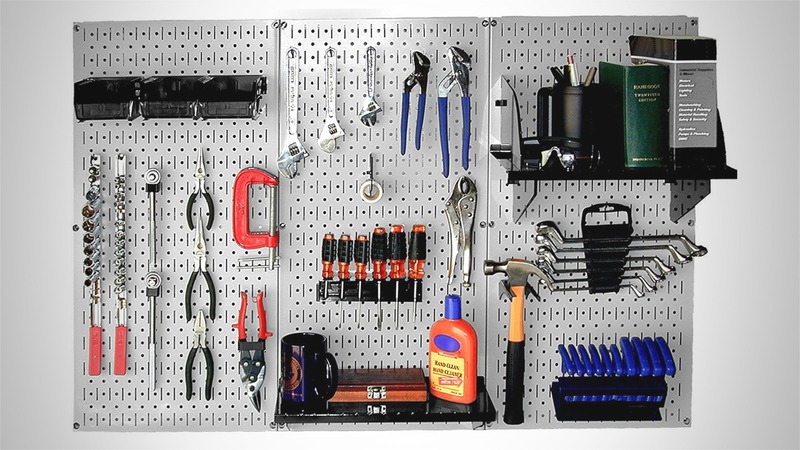 The patented Standard Workbench Metal Pegboard organizer kit from Wall Control offers over 10.5 Square feet of storage space and an all-steel construction that will not warp, fray or crack. Featuring an attractive and sturdy powder-coated finish, the scratch-resistant surface is ideal for haphazardly swapping tools in a pinch while also maintaining the ability to look good. Better still, the pegboard panels are magnetic and accept wall control hooks, brackets, and shelves as well as traditional standard 1/4″ pegboard pegs.